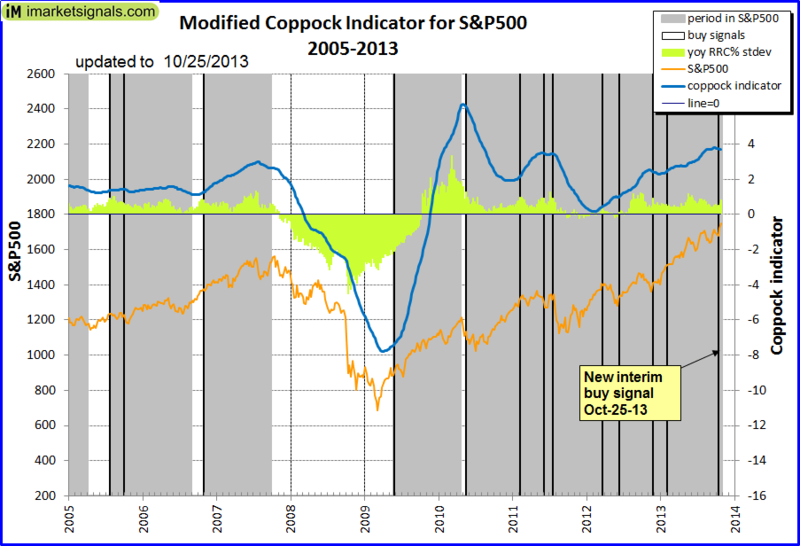 The latest interim buy signal from the modified Coppock indicator was generated at the end of October 2013, and this model will stay invested until September 2014, possibly longer if another buy signal appears before then. The figure below shows the S&P 500 from 2005 to 2013, the modified Coppock indicator, the buy signals, and the model’s investment periods (gray shaded periods). Buy signal dates are indicated by the black vertical lines on the chart. The percentage change of the year-over-year rolling returns for the S&P 500 expressed in standard deviation terms for a 5-year rolling sample period is also shown (the yellow area graph, referred to as “yoy RRC% stdev”). This gives an indication of whether the S&P is overbought or oversold, depending on the magnitude of this indicator.